Windows 8 and Windows 10 include two special refresh/reset features that make it easy for anyone, even those without computer knowledge, to start over with a clean slate and restore their computer to brand-new, clean install condition. Called Refresh and Reset your PC, these features are designed to make manually reinstalling Windows a thing of the past. The most destructive option is called Reset your PC and is effectively a fully automated clean install. All of the programs you installed and files saved will be deleted. Refresh your PC is slightly less destructive as it saves the Windows store apps and settings you installed (sorry traditional desktop apps). Your personal files are also saved. Let’s get started with Refresh your PC. Refresh your PC will only preserve any apps you installed from the Windows App Store and your personal files. Everything else, including traditional desktop applications you manually installed such as Microsoft Office, will be removed. 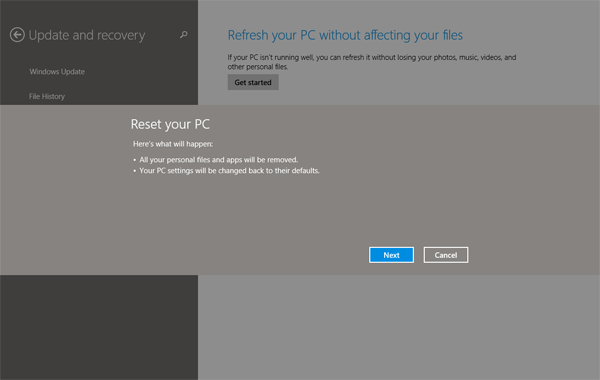 Click on the Start Button, type Recovery Options and click on the settings option called Recovery Options. Under Refresh your PC without affecting your files, click the Get Started button. You may be asked to provide the Windows install DVD or recovery media provided by your manufacturer. When you insert the media, it is automatically detected and moves you to the next step if it is the correct media. Click Next on the Refresh Your PC screen. Click Refresh on the confirmation screen, and the refresh begins. Your computer restarts a few times and then display your logon screen when the refresh is completed. After you log in, all of your Windows Store apps are reinstalled automatically. A file called Removed Apps.html is placed on your desktop, listing all of the traditional desktop apps that were removed. Reset Your PC is the most destructive of the two recovery features because it blows away all of your personal files, apps, and settings. Using Reset your PC is equivalent to a clean DVD install that restores everything on your PC to default factory condition. This is a true reset button for your PC. Under Remove everything and reinstall Windows, hit the Get Started button. Click Next on the Reset Your PC screen. Next, you will be asked if you want to fully clean your drive. Select Just remove my files as this option will just reinstall Windows. Fully clean the drive will wipe the hard drive making it impossible for someone else to recovery your deleted files. This option is perfect is you are going to sell or donate your PC. Finally, click Reset on the confirmation screen. Your computer restarts a few times and then presents you with the Windows license terms when the reset is completed. You need to set up your user accounts, settings, and apps again just like the first time you started using your PC.